The three most important aspects to earn a win…system, system, system. “But we can’t bleat about it, we need to get a win with the team we’ve got. Sometimes the enjoyment of management is about inspiring players. I think our guys are in good shape considering the injuries we’ve suffered”. Here we go again, he always falls back on injuries to justify the team’s appalling form and if Pardew is honestly relying on inspiring his players out of this slump, then we’re heading for a repeat of our relegation year. If any of the players who play for Newcastle United need any inspiration whatsoever, to pull on the shirt and play their hearts out for themselves and the lads, then we’re doomed. 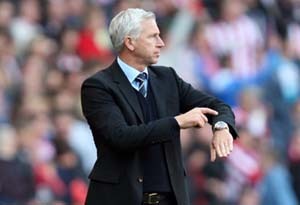 I really don’t care what Pardew says any more, he’s lost the plot and the biggest indicator of this is his steadfast refusal to play a system that stops us from being overrun in midfield and subsequently cutting off supply. Every team that has come to St James,’ with the exception of Man U who brilliantly came with a diamond formation, have come with a 4-5-1 to stop us getting the ball out to HBA or our front two. We’ve consistently been harassed and bossed in midfield simply because we’ve been outnumbered. I’m not the first to say this and I feel like I’m playing the same record over and over again but it’s there for all to see. Pardew has also said his players aren’t taking risks, well sorry Alan, they need to see you take a few risks with the system and get them playing comfortably again. Then perhaps they’ll respond accordingly because it’s difficult to take risks when your backs are against the wall and you’re being hammered week in week out because of that stupid 4-4-2 system you keep playing. It’s about time you swallowed your pride and changed the system or you’ll be plying your trade in the lower leagues again where you belong. What do you think lads…change of tactics or change of manager?